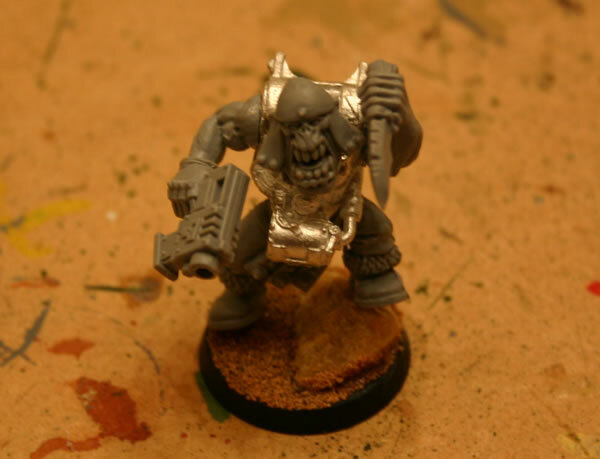 How I am painting my Stormboyz Nob. These models rely heavily on the plastic Ork sprue and I am also using components from the Orc Warhammer sprue. This is part of the work in progress, some have arms, some don't! Rather than use all the heads with helmets that came in the pack I used heads from the Ork Boyz sprue and the Orc Warriors sprue. As you can see from these four, I have made extensive use of the Orc Warriors sprue. Here is a close-up of one of the models. 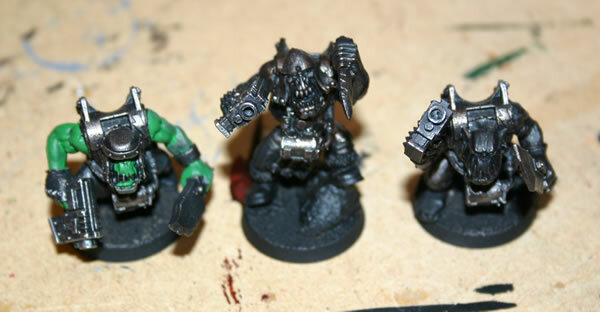 The boyz models were given a black undercoat (spray) and then touched up with a watered down Chaos Black paint. They were then drybrushed with Tin Bitz and Boltgun Metal.